"I saw you a week ago on the ferry from Nigeria!" Stunned, I took a minute to form a response to the man who owned the copy shop across the road from the police station in Bitam, Gabon. And when I did form one, it was lacking in articulateness. Damn, he was right. I started laughing. He laughed too, and then explained why the police had asked him to come across the street to translate for me. "They want a copy of your visa. Here, I will take your passport and make it for you in my copy shop." He disappeared across the street and just then it occurred to me to go with him, but as I was walking out the door, a man in studded, zippered, acid-washed jeans stopped me. 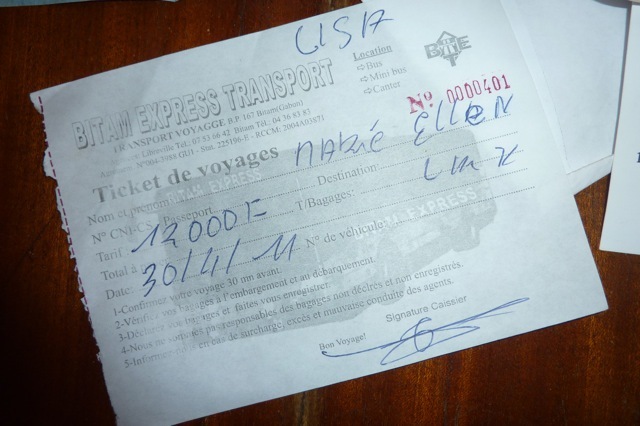 "Hey, I saw you in Yaounde. We were both at the embassy to pick up our visas." And so we had been. I didn't remember the copy shop owner but I certainly remembered this fellow in his flashy-disco jeans. He was still wearing them. I trotted across the road and fetched my passport along with my photocopy, picking up a bottle of water while I was there. "Do you have any food?" "No, but there is some down the road." The copy shop owner waved past the bus, which I could see clearly. I hoped it wasn't going to leave while I was still in the police station. But the policeman stamped me into Gabon quickly, and then walked me outside. 'There." 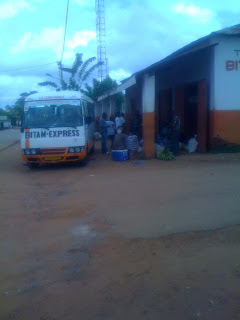 He pointed to the bus, Bitam Express. I walked down and bought a ticket. The man with the disco-jeans took his leave of me—he was only going a short distance today, and needed to track down the share-taxis. "That is wise," I said. 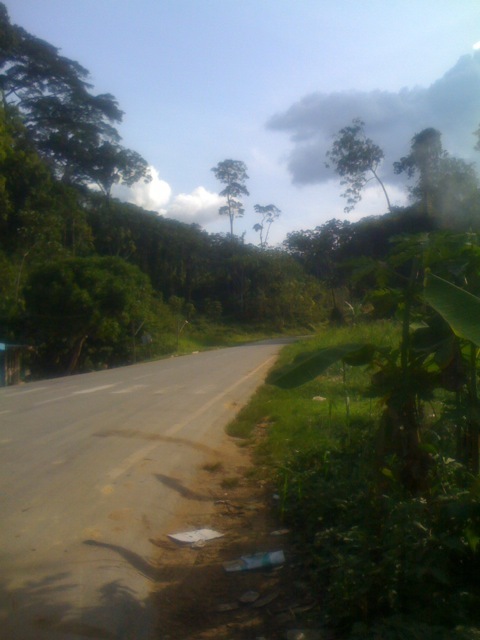 I was undertaking a long journey late in the day. I wanted to get to Libreville. Why? No reason, really. I'd read about and booked into a promising guesthouse, a small family-run place. I had no reason to go to Libreville other than to rest in a guesthouse for a few days, so that I could sort out my approach to Congo. 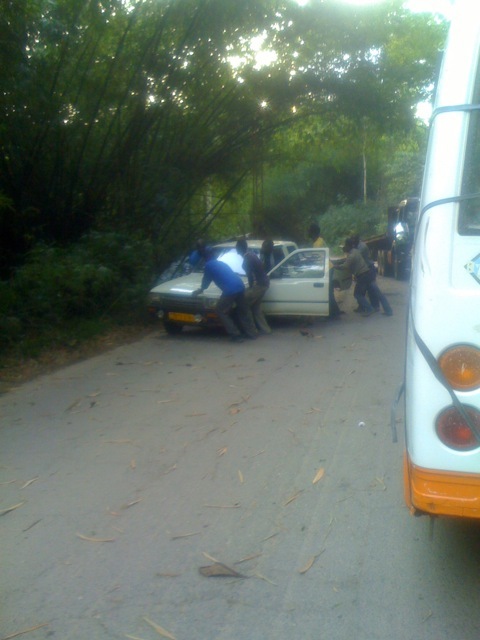 The bus to Libreville was leaving soon, or maybe not soon. The ticket-seller shrugged self-consciously and encouraged me to go find breakfast. "Don't go too far though." I walked down the road as I'd been instructed by both the ticket seller and the man from the ferry. I saw a few shacks that serve as delis in this part of the world. One of them had a man in front with a stack of gray, cardboard egg trays. Aha! That's the breakfast guy then. I didn't have the highest hopes for breakfast, but wanted something with caffeine and something so I wouldn't starve. I was aiming for a piece of bread and a Coke. I pointed to the baguette. The seller nodded. Great. So far, so good. He held up a finger, then two. Did I want one egg or two? Even better, I'm getting an egg with my baguette. Er...it was early in the day. How long has the mayonnaise been sitting out? Ah, what does it matter. Cheap mayonnaise isn't real mayonnaise anyway, and probably isn't even perishable. He smushed a hard-boiled egg into the baguette and spread it around, then covered it lightly in mayonnaise. Like a deviled egg on a baguette. Not bad. Not bad at all. He shook his head, and then the man who owned the kiosk behind him scamped down the road, indicating I should wait there. He went and got the Coke for me, from another shop. 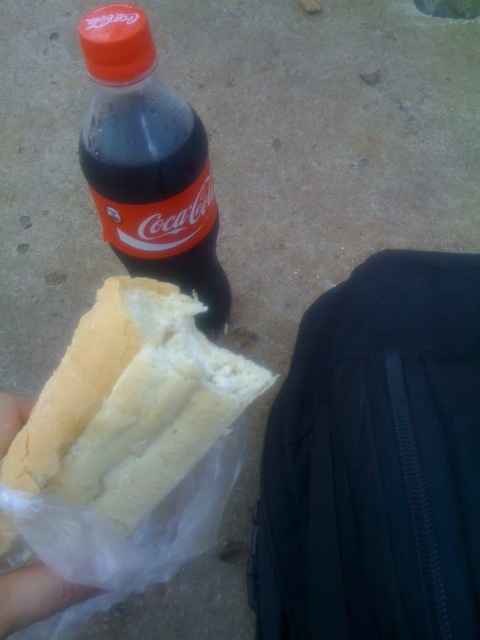 I took my baguette and Coke and went back to the bus garage. There was a concrete pillar nearby, which made a perfect table for this excellent breakfast on a sunny Gabonese morning. I munched slowly and waited. The bus did finally leave, me in the first passenger row in the middle seat. I'd given up on trying to gauge where the sun would be shining during the journey and was now strategically avoiding it. I'd read that this journey was a "hold-onto-your-seat" one. "It seems fine," I thought for the first hour. And the second wasn't so bad. But in time, we ended up driving slowly up and down a mountainous, sometimes-forested, dizzying two-lane winding road. It was that sort of road. In late afternoon, we rolled to a stop. My first thought was that we had a mechanical difficulty, but we hadn't. 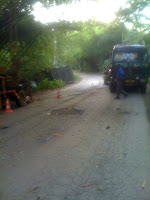 The road itself had a difficulty. Namely, that a small pickup truck had broken down, right in the center of the road. We were in a dense forest. There was no going around the pickup. The guys in charge of our minibus considered the situation. 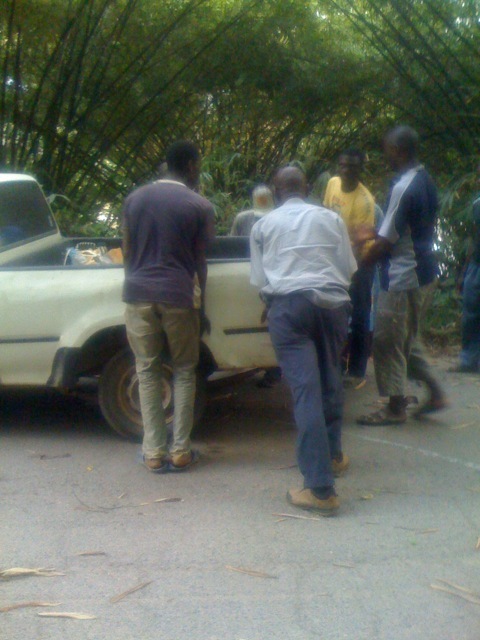 And then all the men from our bus got out and LIFTED the pickup truck out of the way. Meanwhile, us women took advantage of an opportunity. I followed three other women who were looking for a good pee spot. There were no breaks in the undergrowth. The four of us took refuge behind the bus while the men were doing the heavy lifting. We all giggled, squatting there behind the bus on the middle of the road. And then we were off, going now through logging country. We picked up a young woman in a village and drove her to the next town of note. She started some trouble and in time, nearly everyone on the bus was involved in an animated discussion I didn't understand. The woman next to me rolled her eyes and looked out the window. Darkness fell just as we pulled up for a dinner stop/break in the rambling transit/logging town of Ndjole. Others went to find dinner, while I went to find a phone. I wanted to call the Libreville Guesthouse, to let them know that I was on track but arriving on the late side. I raced through town, looking for an internet cafe or telephone center. Both of these things have become somewhat endangered due to the advent of mobile telephones throughout the world. Town was busy, happening. People spilled out of the bars and restaurants and onto the streets. This wasn't a place I'd want to wander alone through after dark on a Saturday night. Which is exactly what I was doing, I realized. I backtracked quickly to the area where the bus was parked and went into a store. "How do I make a phone call," I asked a Lebanese shopkeeper. He motioned to a phone on the wall. Not a pay phone. Just a regular old phone. I stared at it blankly. What the hell was that thing? An antique? I showed him the phone number I had to dial, and he showed me how to dial it. Pretty straightforward. Then I remembered that the woman who ran the guesthouse (her husband was out of town so calling him was out of the question) had said she had plans that evening. Her phone was probably off, and certainly not something she was looking at for the moment. I switched to Plan B. "Can I buy a SIM?" Gabon wasn't on the map for my OneSimCard or my Virgin UK chip. He then walked me next door to a larger Lebanese-owned shop. Moments later, I text my ETA to the guesthouse from the comfort of the bus. We were in Libreville, pulling up outside a bakery by 9:30 or 10. I thought about tomorrow's breakfast for a second, but the croissants looked to be on their last legs. I hired a taxi driver, who followed the directions I'd been given while listening to the BBC loudly. And when we got to the bumpy dirt road that led to the guesthouse, he said "You have to call." "No, just follow the directions." I was flabbergasted. Where was his innovation as a taxi driver? He eyeballed me skeptically from the rearview mirror, drove to the end of the road and then turned around. "See? No hotel. You have to call." So it was up to me. "Drive back, slowly." The instructions were to look for a bright blue gate. Which was right in front of us. I gave the driver a stern glance, got out, and knocked. The security guard was expecting me and had my key ready. I got my bag, paid the taxi driver, and went inside. Looking back, I could see the surprised driver still standing there, caught off-guard that we'd found the place without calling.